Also here is a quiz to determine your dosha, so you know which hydrating water to make for yourself. If you are looking for a good introductory book on the topic, I highly recommend Deepak Chopra’s book, Perfect Health. 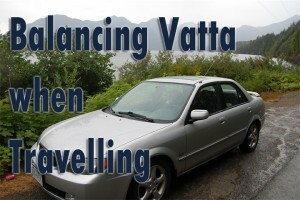 Travel can imbalance in the vata dosha. Vata is already light, mobile and dispersing, so add travel into the mix and it can take a lot of mindful awareness to stay grounded. When travelling (or anytime!) vatas can stay balanced by avoiding the cold and staying warm. Eat warm, cooked, food. Sip on herbal teas throughout the day. Rest, meditate and practice grounding yoga practices. Surround yourself with loving and warm people. 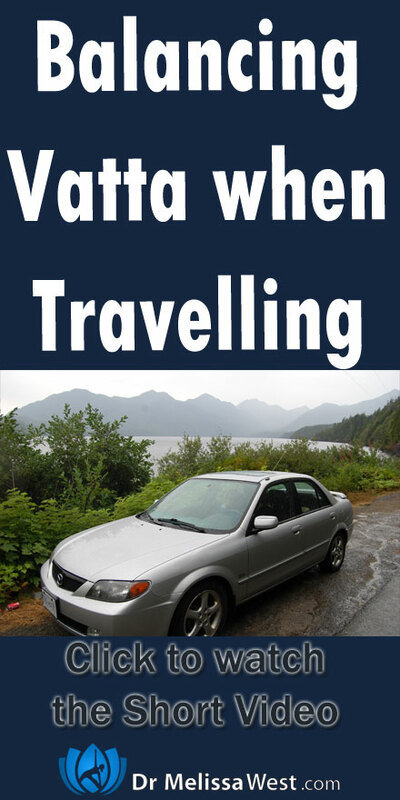 Maintaining a regular routine, even when travelling is extremely important for vata dominant constitutions. Eat and sleep at the same times everyday. Continue to rise early (6:00 am) and go to bed early (by 9:00 or 10:00 pm). Eating small meals (as many as five) every three hours throughout the day helps to support vata. Here are three classes that I recommend most for vata doshas.